by Aldren A. Watson. Softbound, 167 pages, 7" x 10". 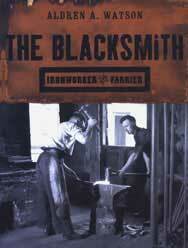 Filled with absorbing information and illustrated throughout, this history-plus-craft book describes the tools and techniques of the black-smith, paying tribute to the skill and ingenuity of this versatile nineteenth century American craftsman. The blacksmith's roles as hardware maker, farrier, and village handyman are vividly portrayed in the lively text and exceptional illustrations. Methods for fullering, upsetting and welding wrought iron are clearly explained, as well as the construction of latches, ice tongs, chains, and a wealth of iron fittings. For those who would like a forge and bellows of their own, the author offers suggestions for laying out a blacksmith shop and constructing a leather bellows and forge. Here is an important record and a valuable source for all who are interested in this part of American industry.